I take great pleasure in writing this testimonial after more than a year since my bilateral knee replacement surgery. That I needed a knee replacement was clear to us but the question was whom to get it done from. That question was answered the moment I consulted Dr. Chirag Patel at Kiran Hospital. I had consulted many doctors but his detailed explanation about my whole treatment and recovery was unparalleled. I got operated for both my knees on 11 Sept 2017 and I was walking confidently on 12 September 2017. I remember these dates because I had endured pain for a decade with every single step. And 12 Sept 2017 was the day that I was pain free and mobile. My recovery was smooth and in 2 weeks of physiotherapy I was back to outdoor activities. I was able to do my morning walks or attend a social gatherings. Over the last year, my knees have given me the freedom to enjoy my life and indulge in travelling. To be honest, I had completely forgotten that I ever had bad knees, until I received a call from his clinic enquring about my well being and reminding me of my annual follow-up. It was heart warming to know that Dr. Chirag, inspite of having a busy days operating and consulting days, remembered his past patients and was caring enough to enquire about their well being. Today, more that 1 year later, I can confidently say that Dr. Chirag Patel is a wonderful doctor who is a master of his craft and I have no hesitation in recommending him for joint replacement surgery. Infact, my brother got his knee replaced from Dr. Chirag Patel 6 months after my surgery. Indeed, Dr. Chirag and his team are the best as far as joint replacement surgery is concerned. I was first diagnosed withOsteoarthritis of the Left Hip in February 2012. I had fracture in my hip bone which was treated with screws & plate albeit unsuccessfully. I was advised then that this failure was a progressive condition and sooner or later I would need Total Hip Replacement. At that time I was fairly comfortable and only required painkillers once or twice a week at best. So I procrastinated and carried on with the occasional painkiller. But as warned, the condition worsened and I needed pain medication more and more often. Finally, in early 2018, I went to Dr.Chirag Patel at Kiran Hospital, for a second opinion. He confirmed the diagnosis and re-emphasized the need for THR. He also told me that this was not life threatening and I could choose my time and place for the surgery. It still took me another few months to finally get convinced. I gradually found quality of life decreasing as walking was becoming increasingly difficult and the debilitating pain became a constant companion. It took me a few days to set up the surgery with Dr. Chirag Patel at Kiran Hospital. I went into his consultation with a million questions and doubts but Dr. Patel is a thorough professional and extremely patient with his patients. He examined me again and then explained the entire procedure for THR in great detail. I found most of my queries being answered without my having to even ask the questions. He is an extremely busy man, but for his patients he has all the time in the world. I really appreciate this very rare quality in a surgeon! I was finally operated in mid-2018 and with physiotherapy, I was walking without support in 1 month. Today after nearly 10 months, I am extremely comfortable walking on all kinds of surfaces and even climbing steps. The pain and the medication are all a thing of the past. I will be eternally grateful to Dr.Chirag Patel and his team. Not only is Dr. Chirag Patel a surgeon par excellence, he is also a very fine individual. He always has time for his patients and responds to all your of questions to ensure that you are assured from all aspects before moving forward. I will highly recommend him to all my friends and anyone looking for orthopaedic advice without reservations. I had knee problems for a number of years. Finally, after consulting orthopaedic doctors, it was clear that a Knee Replacement Surgery was the way ahead. In my opinion, knee replacement was a major operation. Any casualness on the part of the operating team could be disastrous and a big reason to be scared. Hence it was very important that I chose the right surgeon for the job who was caring by temperament, thorough in his approach and had an eye for smallest of things concerned with his patients. The surgery was done on December 18 2017 and I was in the hospital for 4 days. It was painless surgery and everything went off with clockwork precision. I was looked after extremely well during my hospitalization. I was able to walk without any walking support within 2 weeks and I ventured out of my house for my morning and evening walks as well. My life was back to normal. Knee-replacement surgery is like getting a new lease of life. It is my advice to all those who suffer from bad knees to go for surgery. And I strongly recommend Dr. Chirag Patel and his team at Kiran Hospital for this purpose. My mother-in-law is about 72 years old and had come to a point where arthritic knee pain in both her legs was at the threshold of depression. I searched the internet to look out for a good doctor with specialisation in knee replacement. My search led me to Dr. Chirag Patel’s website and I casually popped in appointment booking. In no time, I received a prompt call from his office who guided me through every detail. Having been impressed by the professional outreach of his office team, we decided to consult Dr. Chirag Patel for his advice and expert opinion. In November, 2018 we met Dr. Chirag for complete check-up and advice. It was a great experience in interacting with him. He was very sincere, frank and very articulate in his advice to us and took all the pre-arranged time to review my mother-in- law's case in detail. Based on her overall medical condition, it was decided to do both knee replacement together. It was a big call to get operated for a knee replacement let alone considering undergoing both of them together, but Dr. Chirag’s calm and reassuring persona rubbed off on my mother-in-law and she readily agreed to the surgery. The surgery was done in December, 2018 and has been 100% success till date. The attention to minute detail, focus and commitment by Dr. Chirag Patel and his team at Kiran Hospital is highly commendable. In my humble opinion, his persona as your doctor in the stressful time like surgery is the most important cog in the patient’s recovery. 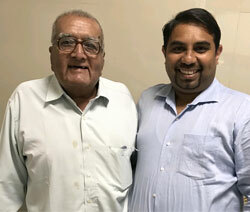 Dr. Chirag Patel's deep insight, commitment & experience put my mother-in-law on the road to complete recovery in no time. I must admit that I was sceptical during the pre-operative counselling when Dr. Chirag informed us that his patients are able to walk on the same day after surgery. However, I was amazed to see the recovery of my mother-in-law and true to his word, as discussed in the pre-operative counselling, my mother-in-law was walking in less than 24 hours after a bilateral knee replacement surgery. I was splendidly surprised to realise that her every goal to recovery was very well explained to us prior to surgery. She was able to leave the walker and move with a walking stick before being discharge. She was confident to move around freely without a stick in 2 weeks’ time. Her surgery had made her younger by almost decade and she was back to her social life in no time. I recommend Dr. Chirag Patel hands down and feel free to reach out to me for any input or feedback. Dr. Chirag Patel is a complete package and the best you can get. I am wirting this on behalf of my parents, Mr. Kesarimal Porwal and Mrs. Laxmidevi Porwal. My parents had been suffering from knee arthritis for quite some time and in the last few years it had become severe enough to restrict their daily life. After consulting many orthopaedic surgeons and clear signs on X-ray we knew that surgery was the way forward. It was really important for me to get my parents comfortable with the treating doctor and the hospital where they would like to get admitted. Our search led us to Dr. Chirag Patel at Kiran Hospital. I had already spoken to few of his patients who had undergone knee replacement surgery under him so I was looking forwards to this meeting and hoping that my search for a good orthopaedic surgeon would end here. was highly surprised to know how approachable Dr. Chirag Patel was. He immediately made my father and my mother feel extremely comfortable in his clinic. His positive and jovial attutide rubbed of on them instantaneously. My mother who was hesitant to consider any surgery was also convinced to undergo the surgery after meeting him. He spent considerable time in counselling them about knee arthritis and how the surgery is performed. He also gave us a very idea about the post surgery recovery. Dr. Chirag also had a very good team setup which was very important for me since my father was suffering from heart problems. My parents underwent thorough investigations before getting admitted for surgery. We met his team members including his physician and anesthetist who would be taking care of my parents during their hospital stay. 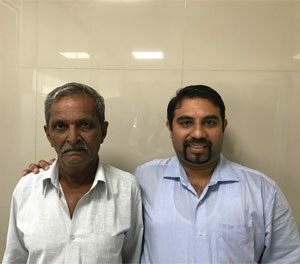 To us, it gave us confidence that Dr. Chirag is a very thorough is preparation of surgery of his patients and indeed my parents went through their surgeries without any problems, They got operated on the same day for unilateral knee replacement under his care. His team and nursing staff at the hospital took great during their recovery. They both were out and walking within 24 hours after surgery. Today, 3 months after their surgery, they are back to their life. A testament to this is the fact that my father is considering undergoing knee replacement on the other knee under his care in near future. I can safely say Dr. Chirag is a highly competent surgeon, a thorough gentleman and kind soul, I highly grateful to Dr. Chirag Patel and his team for helping my parent get painfree and highly active and mobile again. I recommend Dr. Chirag Patel in the highest regard to anybody who is considering knee repalcement surgery. I suffer from a very rare disease called Alkaptonuria. It is a metabolic disease that also affects all the joints in the body. Having been diagnosed with this condition and suffering from joint pains for years, I knew very well that someday knee replacement would be inevitable. What complicated the matter for me was I unfortunately met with an accident which ruptured a very important tendon in my left knee which left me with weak lurching gait even after a surgery to repair the tendon. The superimposed knee arthritis was making my life miserable to say the least. The Alkaptonuria had already affected my back for which I had already undergone a spine surgery. At 74, to consider a major surgery like knee replacement given my medical condition was as scary a thought as it could be. However, I happened to visit Kiran Hospital with my wife for her medical check where I read about and attended a knee replacement seminar by Dr. Chirag Patel. Soon one thing led to another and I was booked for an appointment with him to seek his opinion if my knee could be replaced. I was amazed with Dr. Chirag Patel's simplicity and humble nature. He was very patient in listening to my medical history, examine me in details and then explain me in a simple language what I could expect to gain after opting for knee replacement. His positive attitude rubbed off on me and soon I was booked for left knee replacement under his care. My surgery sailed smoothly and here I must commend his anaesthetist for doing a fantastic job of not only administering me spinal anaesthesia but also keep in me very comfortable and pain free during my stay in the hospital. My surgery was successful and I was well looked after by Dr. Chirag and his sub-ordinates during my hospitalization. Today, 6 months since the surgery, I feel amazing as far as my left knee is concerned and I am gearing up for knee replacement in the other knee after the festive season. I hold Dr. Chirag Patel in the highest regard as far any orthopaedic problems are concerned and can confidently recommend him to everyone who needs a knee replacement surgery or is sufferring from anyorthopaedic problem. I was sufferring from knee arthritis since a long time and after seeing multiple doctors, it was clear to me that surgery is the only option to relieve myself of my pain. It all boiled down to selecting a surgeon and a hospital where I was comfortable, confident and relaxed. My search for an appropriate medical facility led me to Dr. Chirag Patel at Kiran Hospital. A calm and patient hearing to my medical condition gave me the confidence that I was in the right place. Dr. Chirag gave me an detailed explanation about my condition and exactly how this operation is conducted. I was highly impressed with his work flow pattern before admitting patient for any major surgery. Infact, my wife who was also suffering from knee arthritis and had been refraining from surgery for 2 years was also happy to get herself checked and consider surgery under his care. Before my admission, I already knew the team doctors who would be giving me anesthesia and pain medications, my physician who would be managing my medical conditions and diabetes. I underwent thorough investigations prior to my surgery and it gave me immense confidence that with god's grace, everything will sail smoothly. My hospital stay, surgery and my post surgery recovery was uneventful and I was back to walking in less than 24 hours after surgery. I must appreciate Dr. Chirag and his team in taking very good care during my stay at the hospital. My overall ability to move around freely, climb stairs and pursue my job improved with continued physiotherapy as advised by Dr. Chirag at the time of discharge. Today 3 months after my right knee replacement I can happily pursue all daily activities without any difficulty and I am back to managing my business. Dr. Chirag is an excellent doctor and a very kind human being and I can confidently recommend him to anybody contemplating knee replacement surgery. As a testimony to this, I am considering knee replacement surgery on the left side in the near future under his guidance and my wife has already undergone a single knee replacement surgery in his healing hands. My mother is suffering from Rhuematoid Arthritis since many years. Her condition due to rheumatoid arthritis deteriorated to a point where she was struggling to walk even for a short distance within our house.We also noted that her legs were getting bowed over the last few years and it had reached to a point where she was unable to straighten her legs to be able to walk. It was then that we decided to see if there was anything that could be done to help her. We had heard of Dr. Chirag Patel at Kiran Hospital and decided to consult him for my mom's problem. Dr. Chirag was kind enough to spare ample time inspite of his busy clinic and go through her medical history with us during the consult. He explained to us that my mother was suffering from knee arthritis and back problems which were restricting her from living her life comfortably. Her xrays revealed that she was having advanced arthritis and Dr. Chirag suggested us to consider surgery to solve her knee problems. He also explained us the minute details of her entire treatment that will carried out and educated us about all the risks involved in the surgery due to rheumatoid arthritis. 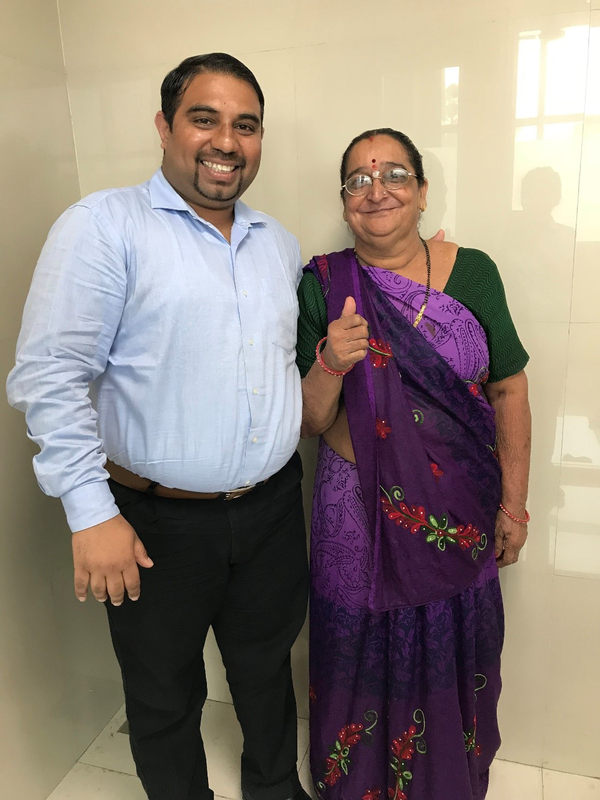 Although we were tensed to accept surgery as an answer to my mother knee problem, Dr. Chirag gave us the confidence to make this difficult decision. My mother finally underwent both knee replacement surgery on the same day. I must mention that his team in the operation theater kept us well informed throughout the surgery period about the progress and helped us calm our nerves. We were delighted to hear from Dr. Chirag at the end of operation to know that everything went well and that my mother was doing very well. Within 24 hours of undergoing surgery. I would like to thank Dr. Chirag Patel and his team from the bottom of my heart for giving a new life to my mother. I wholeheartedly recommend him to anybody who may be considering knee replacement surgery for themselves or their family member. 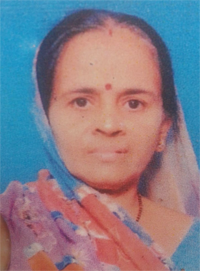 My mother Mrs. Pacchiben Vaghani, is 70 years old. She was suffering from Knee pain due to Osteoarthritis of the knee since many years. We consulted Dr. Chirag Patel at Kiran Hospital. He gave us detailed explanation about the nature of her knee problem and answered all our questions regarding the way ahead and advised us to consider joint replacement surgery. My mother underwent joint replacement surgery under Dr. Chirag Patel at Kiran Hospital. Within 20 days after surgery, she was walking free without any support. Her recovery was far superior to our expectations considering she was undergoing a major surgery like knee replacement and having seen patients who had been operated elsewhere. I have no hesitation in stating that Kiran Hospital in Surat and the treatment given by Dr. Chirag Patel is state of the art. 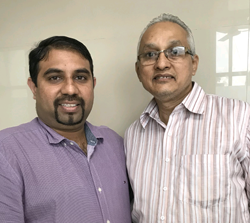 The overall treatement given by Dr. Chirag Patel and his team at Kiran Hospital is comparable to any corporate hospital in Mumbai having seen the results of close family relatives being operated in Mumbai for the same operation. I would also like extend my appreciation to his team members including his assistant doctors and the nursing member for taking good round the clock care of my mother during her stay. I have absolutely no hesitation in recommending Dr. Chirag Patel to all pateints suffering from Knee Osteoarthritis and needing knee replacement surgery. I was diagnosed with a condition called Avascular Necrosis of left my hip joint. Honestly, I had no idea what it meant, all I knew was that it was disabling enough for me to consider quitting my work. I have been working 34 years and to imagine myself giving up my livelihood was a very difficult decision to make. I had been prescribed painkillers by my family doctor who advised me to undergo hip replacement after consulting a joint replacement specialist. My son suggested that I should consult Dr. Chirag Patel, since he had treated a friends mother for knee replacement successfully. 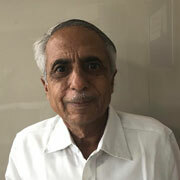 Dr. Patel was very patient in explaining the exact nature of my problem, all my available options in treating my problem and guiding me to the best possible solution. After meeting him, I was convinced that surgery would help me regain my lost active life. I successfully underwent a left hip replacement and I am back to my work after 6 weeks of surgery. I would highly recommend Dr. Chirag Patel and his team for all orthopaedic problems as he is one of the best orthopaedic doctors around. I am indebt to him for getting me walking pain free again and wish him great success in life. May God bless him. I thank you from the bottom of my heart for throwing the pain and discomfort of troublesome knees out of my life. I was suffering from severe knee pain since the last 5 - 6 years. Gradually it progressed to a point where I was almost confined to home and a need to go out even for a social gathering or some work was painful enough for me to excuse myself rather than suffer. I consulted many doctors and was advised both knee replacement but I was only convinced to undergo surgery after meeting you. Your patient and calm nature helped me overcome my nervousness. It is with confidence that I can say that I am happy that I got operated by you. I am also very grateful for your help in arranging for my both knee replacement a few weeks apart and at the same time keeping me in good health to be able to walk along. Just as my first knee replacement even my other knee replacement under your care has been extremely successful. As I write this letter of gratitude, I am happy to inform you that I am completely indepenedent and pain free in all my daily activities. I wish you and your team great success and happiness in life and highly recommend you as one of the best knee replacement doctors in this country. 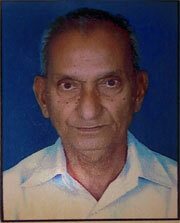 Myself, Mr. Champak Mehta, 81 years of age, was suffering from Left Knee Osteoarthritis for many years. I had taken medical advise for my knee problems on multiple occasions from various doctors. I was advised surgery on all occasions, however, due to my heart problems, I was afraid to undergo a major surgery like total knee replacement. When I visited Dr. Chirag Patel at Kiran Hospital, he examined me in detail and advised me to consider surgery. When I discussed my heart problem with Dr. Chirag Patel, he offered me the option to treat my knee with gel injections and to consult the cardiologist in his team to check if I was fit enough to undergo surgery. The injection gave me pain relief for few months however, it was enough to treat my heart condition to undergo Knee Replacement Surgery. Left with no option but to bear the knee pain, I decided to finally undertake surgery. I was very afraid of surgery, but Dr. Chirag Patel was very reassuring and gave me the confidence that his team was well equipped to take good care of myself. My surgery went very well and I was walking with walker within 24 hours of my surgery. Infact, I was able to walk freely without any support before I left the hospital. I was able to undertake all my routine activities and hobbies 2 - 3 weeks after surgery. Dr. Chirag Patel gave a me good physiotherapy program which helped immensely in my recovery. Today, although I still suffer from my heart problems which are under control, I feel 81 years young in my knees. Dr.Chirag Patel and his team took great care of me during my stay in the hospital. I cannot thank him enough for giving me the pain free life which I desired for. I wish him great success and have full confidence in recommending him for knee replacement surgery. While acknowledging with grateful appreciation to you and your operative team, senior doctors, nurse, good house-keeping staff members, who have rendered their good services, maintaining high standard of patient care to me during my stay dated 22-03-2018 to dated 26-03-2018 for my left-leg “Total Knee Replacement” and express the hope for the continuance of your patronage. May god bring you, good-fortune, good-health and a life full of happiness & just things you so deserve. I sincerely admire services of your dedicated team members including your assistant doctors, Anesthesia Team, operating room and nursing staff at Kiran Hospital, Surat. I suffered Anterior Cruciate Ligament Injury while participating in college sports activities. I consulted many Orthopaedic doctors who all advised surgery to me. However, I was very tensed about undergoing surgery. When I visited Dr. Chirag Patel at Kiran Hospital on the recommendation of my relatives, he examined my knee thoroughly and explained to me in detail what was wrong with my knee. He then suggested me to consider surgery as my injury was unlikely to heal by itself. Knowing the exact problem within my knee helped me overcome my initial nervousness about surgery. Dr. Chirag then explained to me very patiently, how this surgery would be conducted and the likely outcome. He also assured me of giving a time based rehab programme which would help assess my recovery and progress to towards playing again. Convinced that I was in good hands, I went the surgery which went well. It was very kind of Dr.Chirag Patel to inform my family members as well that the operation went very well and that I was expected to have full recovery. I was able to walk out of the hospital with crutches the dayt after my operation and did not experience any pain, something which I was very scared of before surgery. It has now been 3 months since the surgery and I am back to routine activites. Dr. Chirag Patel has given me a rehab program, which has been very helpful in my recovery process. I have absolute no hesitation in recommending Dr. Chirag Patel as the best orthopaedic doctor. I was suffering from left Hip Arthritis since many years. I had consulted many doctors before, who advised surgery for my hip but were skeptical about the outcome considering I was 65 years old. Unfortunately, I met with an accident and fractured my arthritic hip. I consulted Dr. Chirag Patel for my fracutred hip and he advised a Total Hip Replacement Surgery. Dr. Chirag took great efforts to calm my anxiety of undergoing a surgery and also gave me the confidence that I would be walking out of the hospital after the surgery. My surgery was uneventful and I was pain free within two days after the operation. Dr. Chirag and his team at Kiran Hospital took great care of me during my stay in the hospital. I was walking absolutely pain free before I was discharged from the hospital. I have been able to undertake long journeys without any difficulties. It was because of Dr. Chirag and his efforts that I was able to travel to my native place after my hip replacement, something that I had wished I would be able to do for a long time. I only wish I had met Dr.Chirag Patel and had undergone my hip replacement earlier. I was referred to Dr. Chirag Patel by my physiotherapist Dr. Bhavesh Kavad for my troublesome knee pain. I was pleased to meet him for the first time in his clinc and had decided to undergo my Right Knee Arthroscopy Surgery under him. My physiothereapist had informed me about the satisfactory results of his previously operated patients which gave me great confidence to undergo this surgery. Dr. Chirag and his team took great care of me during my stay at the hospital . I was very tensed before the surgery, but Dr. Chirag allayed all my fears and post surgery when he informed that everything went very well and I was expected to have full recovery, I was very happy. It was also a wonderful gesture on his part to inform my family members about my well being after the completion of surgery. Two days after surgery, I was completely pain free and back to my normal life. Dr. Chirag Patel is undoubtedly the best doctor I have ever met. I really would like to thank him wholeheartedly. My Self Jayshree J Vanza (Age 56), was facing knee pain in both of my legs since last 10years. I was facing a lot of problem while walking. One of our relative has suggested about knee replacement surgery, asked us to visit Dr.Chirag Patel, Kiran Hospital. I and my family were so confused about whether to go for surgery or not. 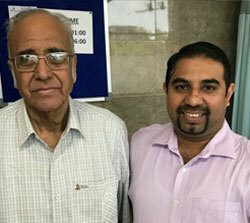 When we met Dr.Chirag Patel, he has explained all the things in detail and cleared all the questions which were in our mind related to Knee Replacement Surgery. Finally we have decided to go for an operation which was done by Dr.Chirag Patel. After operation, I am very happy that it is successful. I appreciate the support and treatment given by Dr.Chirag Patel and all staff members of Kiran Hospital. We are very much thankful to Dr.Chirag Patel that he has provided the confidence and today I can walk without any difficulty. 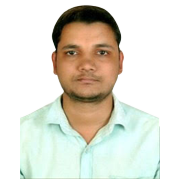 My name is Sanjeev Yadav. I was operated for Bilateral Hip Replacement Surgery by Dr Chirag Patel. It's been three since the surgery and my legs feel absolutely fine. Extremely satisfied with the surgery and recovery of my injury. I believe Dr Chirag Patel is one of the most cooperative and honest doctor i know. Every one of them including the nurses, physio and the staff are amazing. I have no hesitation in recommending Dr Chirag Patel. I am now 100% improved and can't thank Chirag sir enough for his professional, reassuring and approachable service. I strongly recommend. Thank You. I the undersigned, Mr. Manharbhai Patel, came to Kiran Hospital after reading about Knee Replacement in the newspaper. I was suffering from severe knee joint pain since last 15 - 20 years. As a result of my pain, my knee had been severely deformed rendering me unable to walk. I consulted Dr Chirag Patel who advised me to consider surgical treatment and undergoing bilateral Total Knee Replacement. Dr Chirag Patel and his team has conducted a successful surgery on my knees on 02-02-2018. I would like to thank Dr Chirag Patel and his team for their efforts in reshaping my knees and my walk. When i came to knee replacement conference, he had shown his patients walking comfortably in 24 to 36 hours after surgery. Although i was sceptical knowing the condition of my knees, he has accomplished this task and made me walk with any support within 36 hours of surgery despite my complex knee deformity today. I’m back on my feet and able to do all my tasks independently within 3 weeks of surgery. I would highly recommend Dr Chirag Patel for knee replacement surgery and would also like other patients who are suffering from Knee Osteoarthritis to consult him and undergo this surgery. I would like to thank to Dr Chirag Patel and his team for his time and efforts.